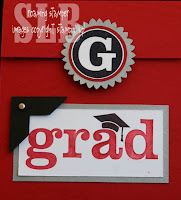 Roaming Stamper: Graduation around the corner! It's so hard for me to believe that my baby, my one and only, is graduating this year. It seems like just yesterday that I dropped him off for his first day of kindergarten. Where does the time go? Now, don't get me wrong I'm probably just as excited about graduation as he is but it's still very hard to believe. This card was made in honor of my son. It uses his school colors of black and red and I added some silver just for style. It's a flap card with the medallion being held on with a velcro dot. I intend to put a gift card in it but haven't done the inside part yet. All supplies available from Stampin' Up!